While the economic outlook for U.S. agriculture has been bleak in recent years, the challenge has been especially difficult for wheat producers. As evidence of these tough times, U.S. wheat acres, which have trended lower since the early 1980s, tumbled to new lows in 2016 and 2017. Furthermore, Brent previously examined the relationship between wheat and corn prices and found current wheat prices are historically low. One of the most evident challenges wheat producers have faced in recent years has been a historically large gap between future prices – the price traded on the board of trade – and local cash prices. This difference –known as ‘basis’ – has been historically wide and creates challenges for producers’ marketing plans. This week’s post considers wheat basis data at three locations to look at the current situation as well as historical conditions. Kansas State University’s AgManger.info has a platform that reports crop basis information. For this post, we considered three locations across the Great Plains – Salina, KS, Dodge City, KS, and Grand Island, NE. These locations were selected because of their proximity to areas with considerable wheat production as well as a long-series of basis data available. Each location had reported data available back to 1999. In Figure 1, weekly reported wheat basis in Salina, Kansas is shown since January 1999. Over the 19 years, the average of weekly reported wheat basis was $-0.24. About half of the time (48%), wheat basis ranged from $-0.20 to $+0.10. Basis was historically strong in 2002 when it reached a low of $-0.06 during harvest. On the other hand, wheat basis were historically weak in 2016 as they hit a high of only $-0.35 during the year. At its lowest, basis in Salina reached $-1.27, the lowest reported in the data series. While 2017 was bad, 2010 was also difficult. Wheat basis weakened throughout the year and reached a low of $-1.20 near harvest. By 2011, however, a recovery began and basis reached a high (for the calendar year) of $0.00 late in the Fall. Figure 1. 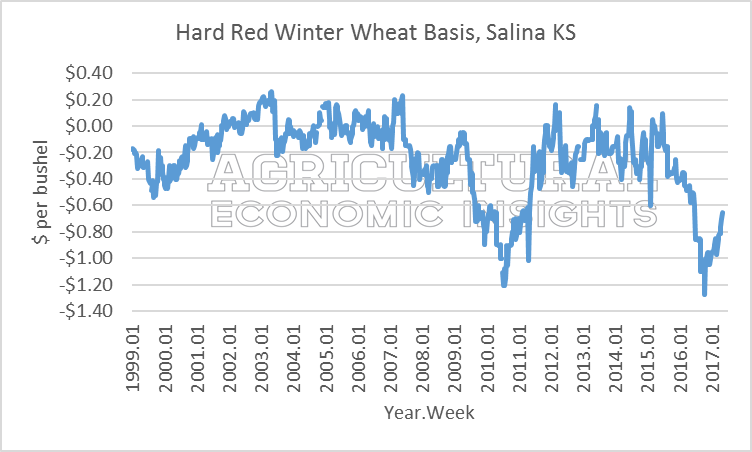 Weekly Basis for Hard Winter Wheat, Salina, KS. 1999 – 2017. Data Source: Kansas State University, AgManager.info. A second way of illustrating recent basis data is shown in figure 2. In blue is the average basis for each week of the year (from 1999 to 2017). Reported data for 2016 and 2017 are also shown, in orange and gray respectively. Early in 2016 basis wasn’t too far below the long-run trend. However, basis softened as summer harvest approached and quickly fell as harvest got underway. The basis lows came in the Fall during week 39. Wheat basis were $-1.00 or less for 14 weeks in 2016. Since February, however, the basis has strengthened. Most recently at $-0.65 (week 18), basis have steadily improved nearly 30 cents from the first of January. Figure 2. 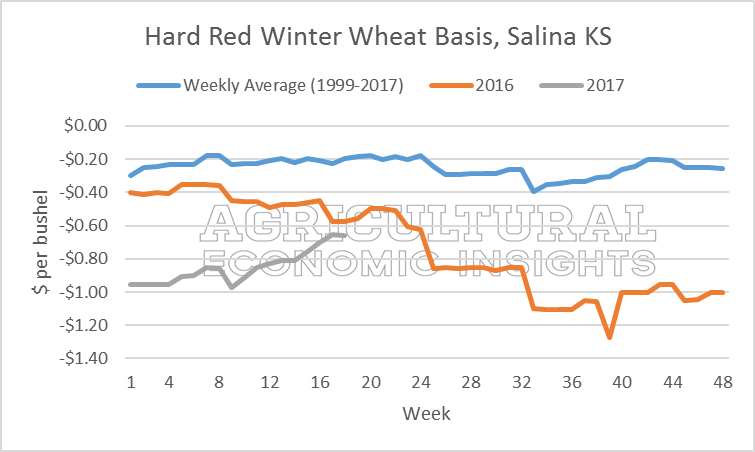 Weekly Hard Red Winter Wheat Basis in Salina, KS. Average from 1999- 2017 (in blue); 2016 (orange), 2017 (gray). In Dodge City, KS, a similar wheat basis story occurred. While the magnitudes are different – wheat basis are typically $-0.40 to $-0.60 in Dodge City compared to $-0.20 to $-0.40 in Salina- the trend throughout 2016 was similar. Basis in Dodge City were below $-1.00 for most of 2016. 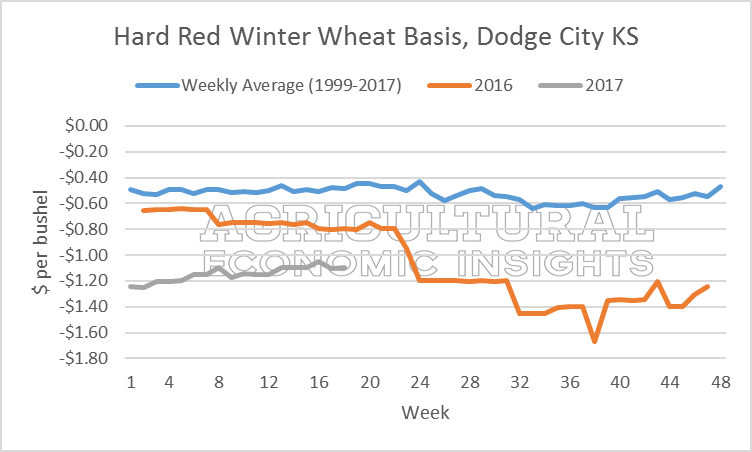 A graph of weekly wheat basis data for Dodge City since 1999 can be found here. Recently, basis in Dodge City have improved slightly. Compared to week 1, wheat basis in week 18 improved nearly 15 cents. This was smaller than the 30 cent improvement in Salina. Figure 3. 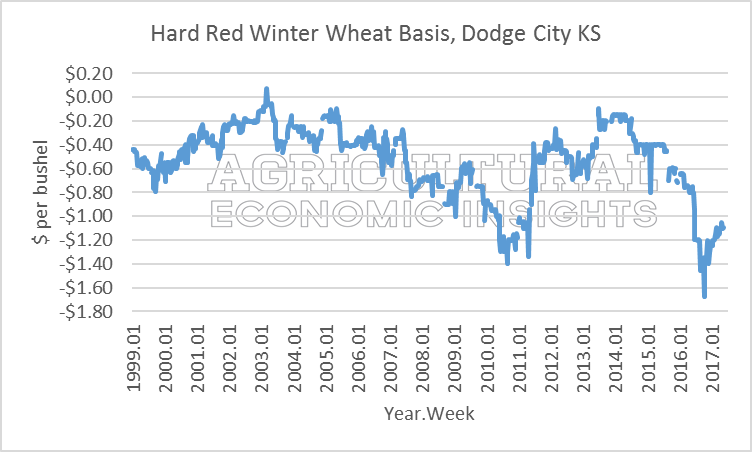 Weekly Hard Red Winter Wheat Basis in Dodge City, KS. Average from 1999- 2017 (in blue); 2016 (orange), 2017 (gray). Data were also considered for Grand Island, Nebraska. Recent basis data are show in Figure 4. Again, wheat basis in Grand Island generally followed the same trend as Salina and Dodge City throughout 2016 and 2017. However, a couple key differences were observed. 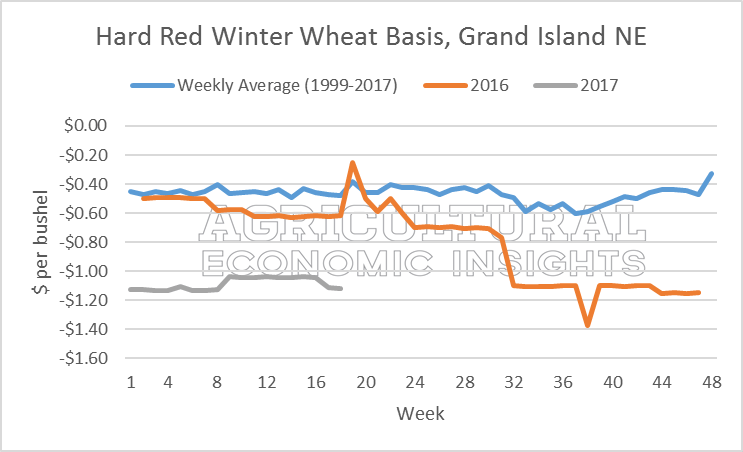 First, wheat basis since the beginning for 2017 have not improved in Grand Island. Comparing week 1 to week 18, basis have changed less than 1 cent. Second, when looking at the graph of weekly reported basis since 1999 (available here), basis in 2016 reached a low of $-1.37. While 2016 basis were record lows in Salina and Dodge City, this was not the case in Grand Island as basis in 2011 were weaker ($-1.65). Figure 4. 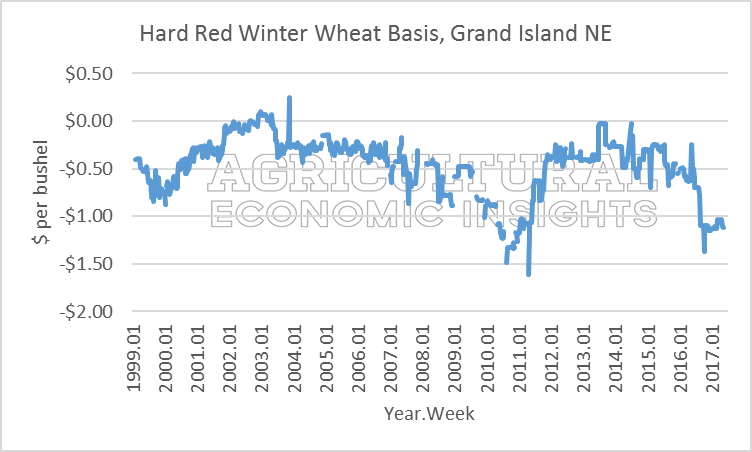 Weekly Hard Red Winter Wheat Basis in Grand Island, NE. Average from 1999- 2017 (in blue); 2016 (orange), 2017 (gray). Wheat basis was extremely weak across the U.S. in 2016. In some locations (Salina and Dodge City), basis were at the lowest levels since 1999. Generally speaking, wheat basis have improved in recent months, but this is not the case everywhere. Where basis have improved, the magnitudes have varied. It is important to note that wide basis are not the cause of low farm prices. Wide basis are not so much the problem, but rather a symptom of low global wheat prices. If basis in 2016 were closer to long-run averages, it’s likely even lower future prices would’ve existed and the final cash price farmer received would’ve been about the same. The challenge with basis that are historically weak (or even strong) is it’s difficult for farmer and grain buyers to use traditional pricing management tools and strategies. For example, if a farmer hedged the sale of wheat on the board of trade in early 2016 with the expectation of $-0.20 basis, they were disappointed to find their basis at delivery was more like $-1.00. This is a difficult situation to manage, especially as producers start to think about 2017 and their expectations for prices and crop budgets. In short, these are difficult economic times for producers. This has been especially true for wheat producers who, given historically wide basis, have found the traditional farm and risk management tools more difficult to use. As 2017’s wheat harvest closes in, many producers will be encouraged to find basis have improved in recent months.